Your food waste caddy is collected every week from the kerbside. The weekly food waste collection service allows you to recycle all types of leftover and unwanted food. On your collection day please present your caddy at the kerbside or agreed location by 6:30am on the morning of your collection. All types of food waste - cooked and uncooked. 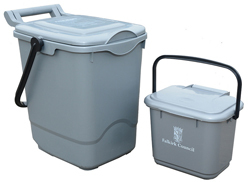 We will provide you with two caddies to recycle your food waste, a small caddy for your kitchen and a larger caddy to present at the kerbside on your collection day. How do I use my food waste caddies? Please do not place plastic containers in your food waste caddies. If you find an out of date yoghurt pot in your fridge, empty the contents into your kitchen caddy, rinse the container and place the container in your blue bin for recycling. Use liners for all food waste. Once full tie/wrap up your liner tightly before placing it in the kerbside caddy. Using a plastic bag, biodegradable liner or newspaper will keep your caddy clean. Make sure you keep your kitchen caddy lid shut. Please remove all packaging before putting food waste into the caddies. The kerbside caddy should be locked at all times by pulling the handle upright.